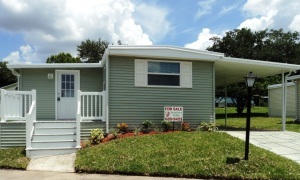 Judging by the consistently high number of manufactured homes for sale in the Tampa, Florida, area, it is sensible to conclude that this style of housing has become immensely popular. What are manufactured homes, exactly, and why should you consider buying a manufactured home instead of a mobile home? A manufactured house is one that is built inside a factory and subsequently transported to an installation site, which is usually leased land but can be owner-occupied property. The primary difference between a manufactured home and a mobile home is this: a manufactured home is built to comply with a strict federal building code (HUD Code) that was instituted in 1976 to address the many deficiencies in quality that had beset mobile homes for decades. The result is that, today, manufactured homes are arguably just as good as, if not better than, site-built structures. They are built inside highly advanced factory environments and feature all the creature comforts that you would expect to find in a home built in the conventional manner. And, construction costs per square foot for a new manufactured home are 10 to 35 percent less than a site-built home, excluding the cost of land. The popularity of manufactured housing can be attributed to the fact that it makes quality housing affordable for people who otherwise might not have the ability to afford it. Residents of StrawBerry Ridge – a 55+ community near Tampa, FL – are able to enjoy the cost-effectiveness of manufactured housing in a secure environment with lots of amenities. Our 150-acre gated development in Valrico, FL, has long been a magnet for retirees who want to stretch their savings to the fullest. Contact our Lifestyle Team today for additional information about our wonderful 55 and over community near Tampa, FL, as well as a current listing of our manufactured homes for sale.